Dumped State Farm insurance. Got trike insured by Harley Owners Group (Progressive) with Total Replacement Cost, vanishing deductible, tons of discounts, trailer coverage, and recovery coverage for $89 / month. Progressive alone would be more than State Farm, but HOG has a contract with them which requires them to provide pretty large discounting. So my horse is insured for half the cost per month as it was up until May. This afternoon i did a led headlight bulb upgrade for the 91 vfr 750. then took it out for a evening ride. Now i can see all the deer i was missing in the dark. evitek bulbs went in easy. First ride ever on my GL650I Silverwing. I bought this earlier in the spring for $400 sight unseen. PO started taking it apart resulting in some missing parts. My most wonderful favorite nephew went and made the purchase for me in the South Bend, Indiana area from craigslist. I pulled the carbs and cleaned them. That's really about all I've done so far. When running, it sounds like it's in need of a valve adjustment. The big issue is the starter clutch, so the engine will have to be pulled to fix that. I've not ever heard one squeal and slip like this one. Should nickname her Piggy because of that squeal. It's a bit of a time getting it started with that slipping starter clutch, but I really wanted to see what it was like to go down the road on it. I'm just happy to see that she will go down the road without being pushed, pulled or tied to a trailer! I'm pretty dang happy with my $400 crap shoot. Adjusted the valves on the Silverwing. That had to be the easiest valve adjust ever. Cylinders sticking right out there at ya. Bought a tool that makes it even easier to find top dead center from a guy named Murry. Murry is the SISF of the CX/GL 500's and 650's. Gotta love how easy this bike is to work on. Cool. I put some more bugs on my Versys today in BC, 300 km worth. On TDY in Salmo BC. Changing all three cases (crank, gearbox, primary) to appropriate Redline synthetic. The Redline V-Twin Transmission Oil is the bomb for most V-twins that have seperate cases. It starts out with a base that is already full rated viscosity, whereas many synthetics have a base lower than rating, and put in additives to raise it to the rating. Basically it comes in exceeding rating. The effect is most noticeable in how quiet the gearbox becomes, and the shift clunk snick clunk goes away. I'll be doing this in the next day or two, just waiting on viton drain plug gaskets in case the one on the plug now can't be reused. Often they can, but if it doesn't look perfect I'll replace it. I also plan to put Redline in the crankcase and primary case when I get out to California, before I go to the NW Regional. I had new dancing shoes installed on my itty bitty six fiddy Versys this morning. Angel GTs. Rode about 60 kms from the dealer back to campsite. Me like. Gonna stroll about 400 tomorrow probably including some dirt. Yeehaw. On TDY at Yoho National Park for two more nights. Then Kelowna BC. I made a great find on EBay. I found a set of 1975 VM 28's that have spent the last 40 years sitting on a shelf. The PO took these carbs off his 1975 Z1 in 77 to put bigger carbs on. he stuck them on the shelf and this is where they stayed. I asked about the float legs and he said he didn't know because the bowls had never been off. OK crap shoot. I got the carbs and took the bowls off for cleaning. I think he was right because it appeared no screw driver had ever touched the pilot and main jets. The float pins moved freely. Every VM 28 I've seen the inside of to date some yo yo has taken and roughed up the float pins to keep them in place. They did not understand the bowl is designed to keep the float pins centered and not move. In the bottom of the bowls was a little dust looking stuff. On the 900 they go. I'm happy to report very small air valve screw adjustments will slightly change plug color or at least what plug color you can see with unleaded gas. A trip up Washington pass and back from a pure gas gas station got me 45 miles per gallon. Best thing is the 900 runs like a 900 should. I rode my 84' Honda VF700S Sabre up to Cycle Barn to get some brake pads and order tires for the new to me 94' C-10. Those came stock on my 78 Ltd.. if I knew you wanted some, I could have hooked ya up... what jets did you use, and did you modify and remove the extra air plenum for the airbox? Took the front end off of the Silverwing. Removed the brake rotors and cleaned the wheel. Replaced the old brake rotors with some I picked up on ebay for $30 a pair shipped. Removed the steering head bearing races from the steering head and will replace with tapered roller bearings. Going to pull the engine this weekend and rebuild the starter clutch so Piggy will quit squealing when I start her up. The SilverWing was my first "real" street bike. Paid $900 for a rather nice low mile Interstate version with all the original Honda faring/luggage. Always enjoyed the engine design/layout. With a desire for more power, especially two up, I bought the first C10 (and a second C10). The current ST1300 brings me back around a bit. Looks like a nice little wing you had Marc. I've known a couple of guys that had Moto Guzzi's in the past. The SilverWing is an improved Guzzi as far as I'm concerned. I've just always thought the Honda was an interesting little bike. This one showed up on craigslist, so I bought it. If I could only have one bike, I probably wouldn't have bought it. It just adds a little spice to the garage. The engine is out and waiting to be opened. I should have done more reading about starter clutch problems. The 3 bolts that hold the clutch on are one time use bolts that I didn't order. So going to order those and all the bolts and nuts that are missing on the rest of the bike and work on other things on the bike. The starter is also something to be looked at while it's out. Guys on the CX/GL forum have done a mod to improve the ground on the starter to get full rpm output. Apparently a slower than normal starter can lead to starter clutch problems. Thanks, it really was in pretty nice shape. Bought it on a whim 175 miles from home. Left my car at the guys house, rode it home from the city with very expired plates/tabs, no maintainence history, and a bad rear tire. The look on my wife's face when I got home was a classic . But, she did go along the next day to retrieve the car and is a willing passenger for up to a 100 miles at a stretch. We may tour our honeymoon route through Ontario for or before out 40th anniversary this October. Never has any issues with mine despite its age, other than it was starting to very slightly weep of some coolant from the dreaded waterpump. Did some research on that and it wasn't the worst thing to source the pump from a Yamaha (if I recall correctly). Pointed that out to the new buyer and gave him some info I had printed out. He indicated that unless it got a lot worse it was easier to add coolant on occasion than tackle the repair. Since you have the engine out and it's a common issue, it might be worth doing a waterpump replacement now since it seems to be a "keeper". 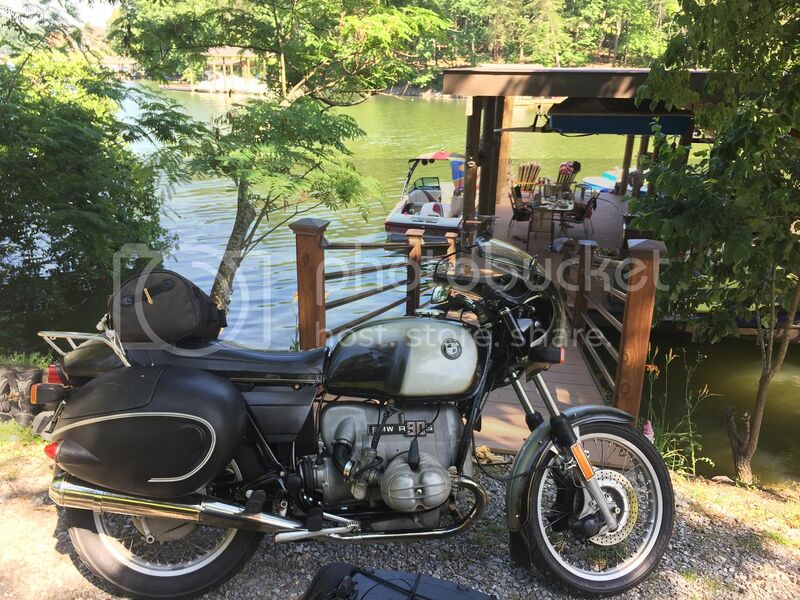 A Moto Guzzi finds its way into my Craigslist "Favorites" list somewhat regularly, so perhaps some day one will share the shed with the ST1300. I tend to like the less than common stuff, I guess. A KLR or a 650 BMW is a more likely second ride and would be great with all the gravel back road forestry stuff up here. The one or two year build of the Honda 650 V twin models always get my attention, also. Good luck on that 500 refurbishment. It's the 650 Interstate instead of the 500. I'm not sure I would have bought it if it were a 500. There was a time when I wouldn't have bought anything smaller than a 1000, but the 650's have always caught my eye and were a one year only model iirc. 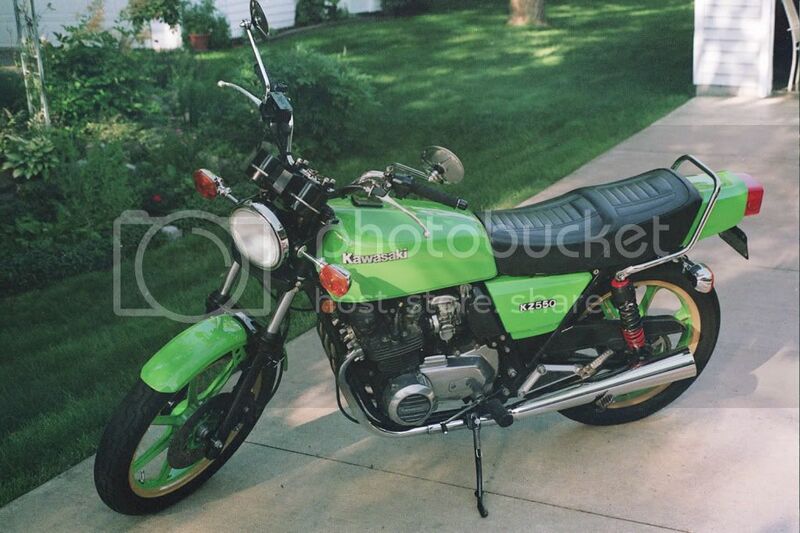 I can possibly see another RD400 in my garage one day. Such a fun lightweight bike. Lowered trailer weight so the horse doesn't have to work so hard. Dan, the Vm28's I got were stock to the bike. I squirted some carb cleaner here and there and set two floats using the clear tube test. The stock jets I believe are 120's and the pilots are 17.5. After cleaning them and doing a little adjusting the bike runs pretty good. Not real happy with the idle but such is life, it will idle just a little higher rpm than I like still but unreasonable. Mileage seems to have stabilized at 45 MPG. Today a bug hit one of my damaged fingers while wearing full fingered glove and it hurt like..well lets just say it hurt A LOT. The GL650 Interstate project continues. Pulled the rear wheel and final drive. Removed old tire. Polished the rim and installed new tire. Disassembled the rear drum brake, cleaned everything up and installed new brake shoes. Polished and painted rear brake stopper arm. Installed new dust seals on the front fork tubes. Cleaned up the airbox. Have the frame hanging so that I can clean and deal with rusty spots. Disassembled the driver footpegs and buffed on wire wheel , followed by paint and clear coat. Soaked the battery box in vinegar overnight. Sprayed it with primer. Removed horns before soaking the fairing mount and associated hardware in vinegar to remove rust. Vinegar is cheap and works amazingly well if you have patience. Cleaned and painted the rear shock. Drain the old oil from the rear shock. Sooner or later I'll run out of parts to clean/paint. Thinking of masking unpainted parts of the alloy wheels and painting the black parts. Any suggestions on wheel refinishing that are cheap will be considered. I'm probably going to spend too much on this project as it is. R&R 'd the carb on my klr 250. Found the pilot jet totally clogged. Ordered new jet. Also needed new float bowl screws. $2.85 at dealer- a mere 31 cents at Ace. Look into "Plastidip" for coating your wheels. If you don't like it you can peel it off! Resists chips, is fairly durable... etc, etc. Page created in 0.642 seconds with 25 queries.